This audio/visual alarm combines a bright LED strobe with an 87 dB piezo alarm. The Micro-burst Strobe LED Warning Light combines state of the art circuitry, a sonic welded housing, and an industry leading five (5) year warranty. 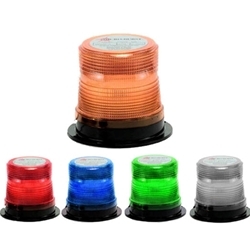 The Micro-burst lights are multi-voltage, 4.6 inches wide by 4 inches tall, sealed to keep out dirt and moisture, and reinforced to protect against shock and vibration. This beacon light is ready to be hard wired to 120V power source for permanent or semi-permanent installation. This product is made to order. Please allow 7 to 10 business days for factory assembly.